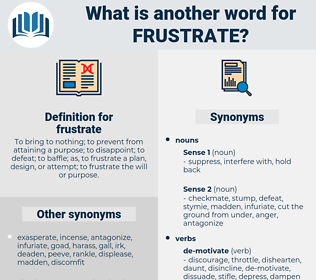 What is another word for frustrate? To bring to nothing; to prevent from attaining a purpose; to disappoint; to defeat; to baffle; as, to frustrate a plan, design, or attempt; to frustrate the will or purpose. derail, hinder, obstruct, hamper, undermine, deter, counteract, nullify, prevent, disrupt, negate, forestall, discourage, foil, counter, impair, jeopardize, stifle, interfere, destroy, block, inhibit, constrain, preclude, preempt, disturb, demolish, curtail, circumvent, shatter, affect, avert, spoil, sabotage, stop, curb, endanger, jeopardise, hobble, overthrow, destabilize, reverse, wreck, undo, fail, halt, restrain, erode, restrict, oppose, stall, dampen, complicate, harm, offset, smash, tarnish, contradict, undercut, threaten, resist. thwart, impede, stymie, abort, scuttle, disappoint, defeat, subvert, antagonise, outsmart, pre-empt, antagonize, overturn, outwit, upset, torpedo, embarrass, demoralize, deprive, dash. encourage, open, help, surrender, validate, permit, inspirit, cooperate, approve, assist, abet, yield, retreat, lose, allow, support, let go, release, aid, push, give up. further, boost, rally, inspire, lift, strengthen, quicken, fortify, reinforce, gladden, nerve, hearten, galvanize, forward, buoy, stimulate, cheer, enliven, enforce, facilitate, animate, energize, stir, smooth, steel, ease, reassure, excite, assure, provoke, advance, invigorate. Vague as reverie, fitful as thought, yearning as frustrate love, it fluttered about them. I knew that she would insist on telling my father, and thus possibly frustrate my plans. disappoint, let down, ruin, dash, short-circuit. foreclose, forestall, preclude, forbid, prevent.